For consensus GBP/USD forecasts from the world's top 50 investment banks for October 2018 through to October 2019, please download the latest report produced in conjunction with Horizon Currency Ltd. Kicking the “cliff edge” can down the road should spell welcome relief for the Pound while strong fundamentals may offer the Dollar some respite. However, extreme bullishness threatens to leave the Euro with a hangover. Not even a restless Bank of England can save the Pound from renewed weakness this year, while the Euro also faces headwinds in the short term, leaving the US Dollar as winner this quarter and next. "As GBP/USD rose through $1.4150 and GBP/EUR headed up towards €1.15, USD and EUR buyers were tempted to top up hedging levels, with the GBP/USD rate at post Brexit highs." Pound Sterling is set to edge higher against the Euro in 2018 and risks are to the upside, according to Danske Bank analysts, who warn EUR/GBP could break "considerably lower". Change will remain a continuing theme as far as G10 currencies go in 2018, or so Morgan Stanley forecasts appear to suggest. The Dollar will trade mixed, the Euro is to rise, the Pound to fall and the Yen to fall in 2018, according to the latest forecasts from Swiss investment bank UBS. 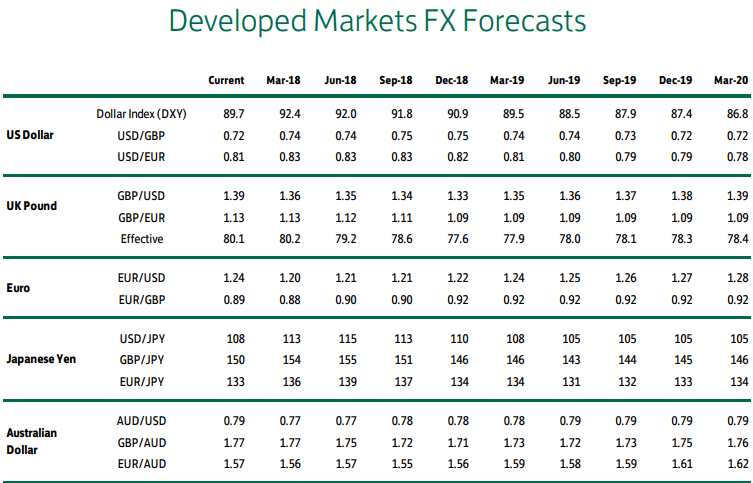 2018 offers both continuity and change for the majors, according to Barclays' forecasts, with more losses in store for the greenback but some respite for the Yen and Pound Sterling. 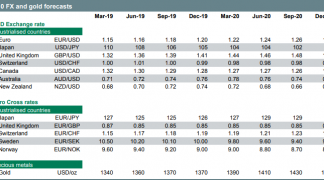 Analysts at Crédit Agricole have issued their latest exchange rate forecast tables and fundamental views on the world’s major currencies.